The T-01MC moving coil phonostage has been designed to work with every moving coil cartridge from a DL-103 to a Clearaudio Goldfinger Statement. We know that because we have tried them all and many, many others. The design comes from Dave Cawley who designed and built his first MC phonostage in 1981 and recently manufactured the award wining A.N.T. Kora phonostage. Dave also had a £9.5K phonostage re-engineered and used it as a reference, the results were amazing and somewhat surprising. Building on his experience Dave has now produced a dual-mono phonostage with not a single integrated circuit or bipolar transistor in sight! 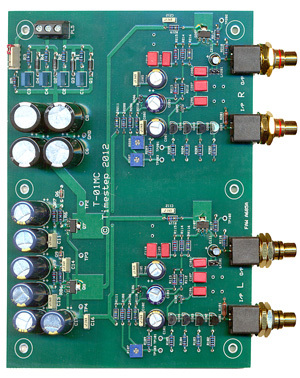 No less than 16 FET's are used including a FET discrete power supply. The input FET's are laboriously hand tested and categorised before being inserted in blocks of 8 into the PCB. The dual mono design is very evident just from looking at the PCB, indeed with a small saw you could make it completely mono, although we don't recommend this! Great attention to detail was applied both in the design and later in listening tests. The very expensive Dale input matching resistor coupled with the PTFE input sockets were probably the most influential, followed by the Wima polypropylene RIAA capacitors. The biggest sound improvement is by using only FET's and no overall negative feedback. The T-01MC has been directly A-B compared with several phonostages costing up to £9,500. How did it sound? as good but with less hum! How could this be we hear you ask? Well the circuit and components are very similar, but we don't put it into a huge, two-box enclosure weighing 30kg. Instead we use a simple but well made case and a very, very expensive hum-free transformer. Truly a case of less is more!